Mallorie Freeman was born and raised in Cleveland, Ohio. Her mother was a pop singer in the 1960’s, owner of a modeling agency, television producer, and a makeup artist. The prominence of femininity, creativity, and entrepreneurship greatly influenced Mallorie from a young age. 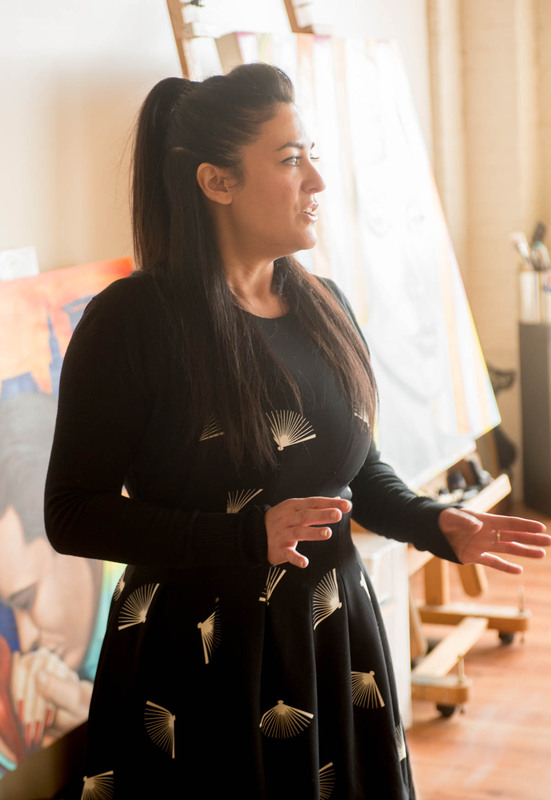 Mallorie attended the School of the Art Institute of Chicago and the Cleveland Institute of Art. She has participated in a number of regional and national exhibitions, and residencies. 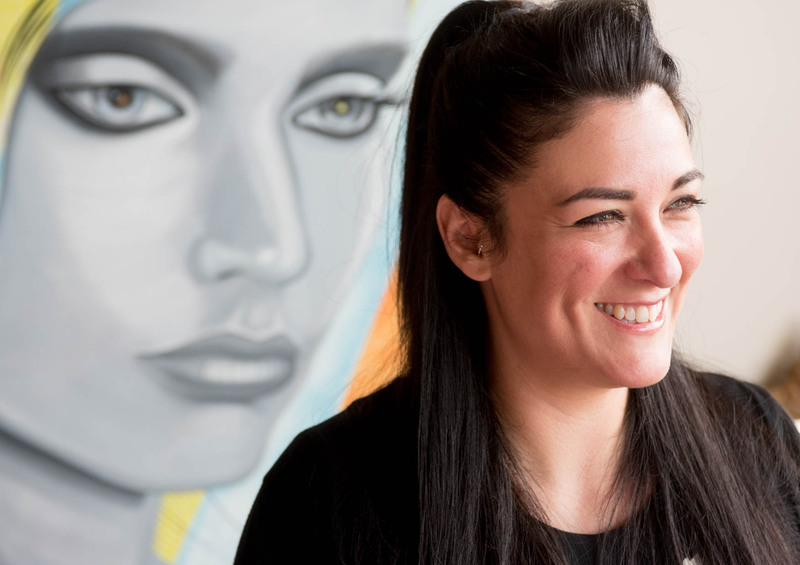 On May 21st and 22nd Mallorie will participate in Rooms To Let, which seeks to re-envision one of Cleveland’s most diverse and authentic neighborhoods, as it illuminates a passionate community in the midst of recovery. Dozens of artists and makers will create works in vacant homes– some of which are slated for demolition as well as in those that will be rehabilitated. The event is free and open to the public. The lighting is probably my favorite thing about my studio. One of the walls has large north-facing windows and the light is pretty consistent throughout the day. The view of nearby rooftops and train tracks is also one of my favorite things. Is your studio a place to relax, get down to business, find inspiration, or something else altogether? My studio is also my home and is a combination of relaxation, getting down to business, inspiration, and many other things. For some projects I use chocolate as the medium. It is helpful to have a stove to melt the chocolate and a refrigerator to cool the molds. There are downsides to having a studio in my home. On more than one occasion, I have burnt dinner due to cooking and painting at the same time. If you could describe your studio in ten words or less, how would you describe it? Peaceful, city, loft, art, fortress, with kitty and passing trains. How or why did you decide to pursue your art? I don’t think there was ever a time I wanted to pursue something else. I decided to apply for art school after receiving a number of awards for shows and competitions in high school. I received a scholarship from the Solon FIne Arts Council and attended the School of the Art Institute of Chicago upon graduation. Currently, what medium are you working in? I am currently working on a project called “Rooms to Let”. 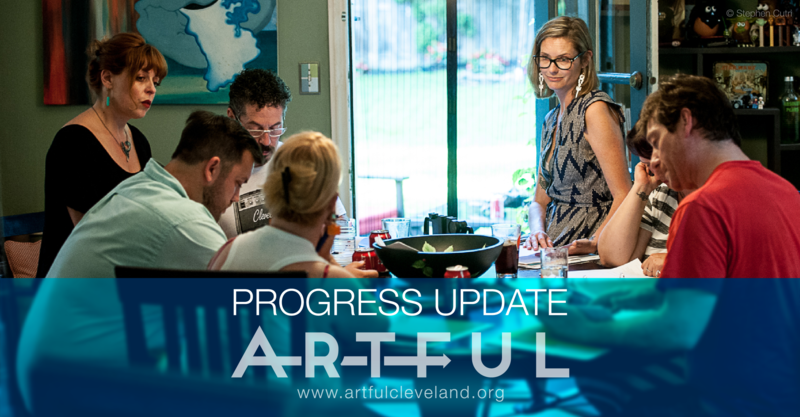 Artists were invited to create installations inside of abandoned/foreclosed homes in the Slavic Village neighborhood of Cleveland. I am using colored chocolate and paint as the medium to transform an upstairs landing/hallway/sink/vanity. This is the second year I have participated in “Rooms to Let” and I love the challenge of creating site specific work in a unique environment. The house I am working in is set to be demolished after the event. The project is bitter-sweet and I think chocolate is a perfect medium. I work in various media and approach each project in different ways. For the “Rooms to Let” installation, I started by measuring all the surfaces to be covered in chocolate. I hand-cast the chocolate pieces from molds in my studio. The cast pieces were laid out to fit the exact sizes of the surfaces and photographed for reference. The walls, floors and surfaces were painted in similar colors as the chocolate. The cast pieces were then transported and adhered to the walls and surfaces with melted chocolate using a hot plate and double boiler. How do you find inspiration? Or what resources do you take advantage of to assist you in the creation of your art? I find inspiration everywhere: travelling, watching movies, vintage magazines, walks in the park, candy wrappers, county fairs, conversations with friends, thrift stores, etc. For a past printing project, I found inspiration in my neighborhood while riding my bicycle. I discovered hair weaves on the side of the road, in alleys, and on sidewalks. I took them to Zygote Press, rolled ink on the hair and ran them through the press to create impressions on paper. What is your greatest challenge when it comes to your art? The business aspect to making art can be a challenge for me at times. Artists have to wear many hats. Not only do we create the work, we have to promote, network, and market it as well. Speaking and writing about my art in a clear and concise manner is something I continue to work on over the years. If you could offer one piece of advice to aspiring artists, what would that be? Make mistakes, challenge yourself, practice discipline, and step outside your comfort zone. I have made some of my best work when I was not really sure that I could accomplish it. Do you feel your community is supportive of the arts and/or how can your community better support the arts? Moving art outside of a gallery setting makes art more tangible for the community. As we were working on our pieces for “Rooms to Let”, we invited the neighbors in to the house to look around. Most might never go to a gallery, but because an art event is happening in their neighborhood, it raises curiosity. A couple of the neighbors we met were/are artists and were excited to see the houses come alive with colorful exteriors and lots of activity. The art community is relatively small in Cleveland. Events and projects that make art more accessible allow those who are outside of the art community to become more supportive. 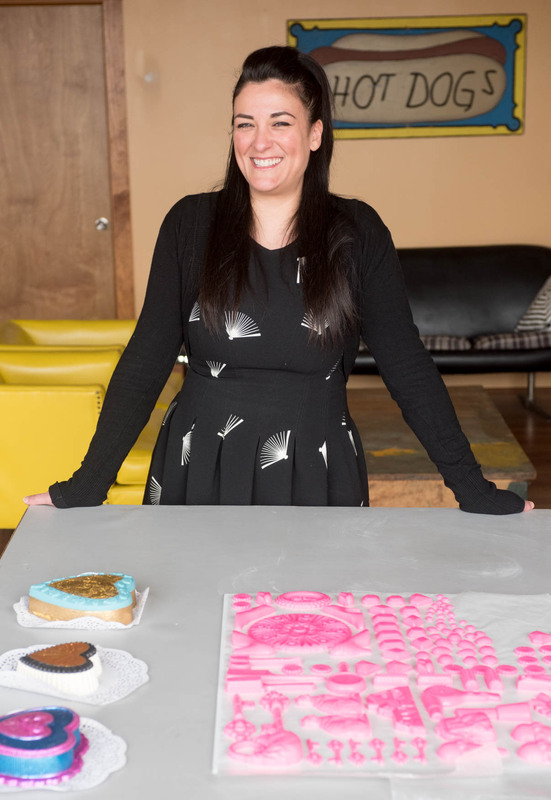 Mallorie Freeman and her handmade chocolate art for Rooms To Let. 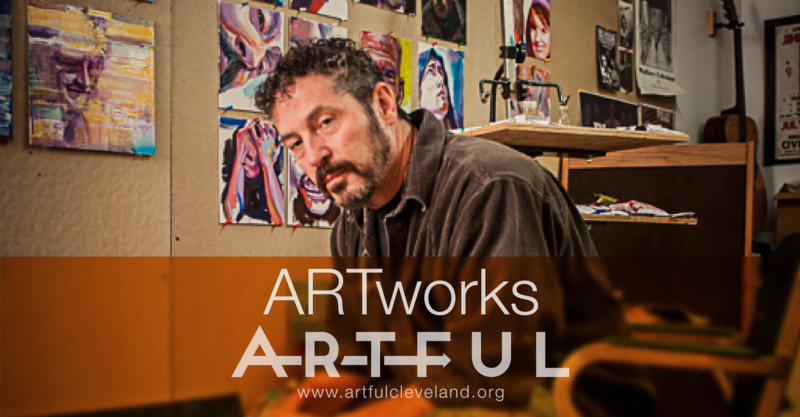 Previous Previous post: ARTFUL and LaureLive – Music With A Mission!